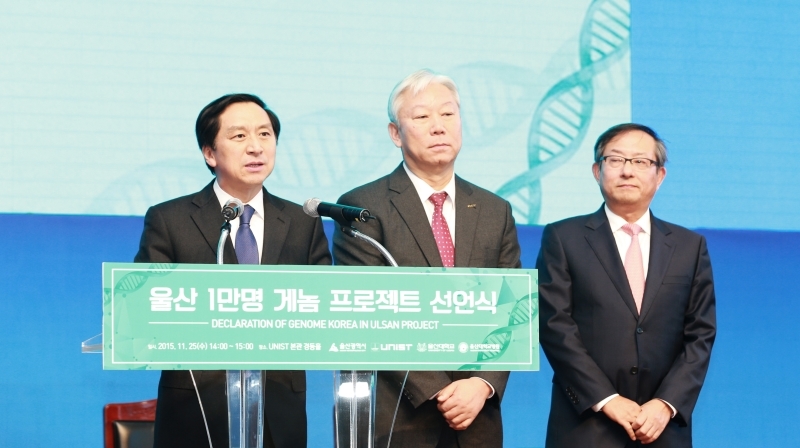 The Ulsan 10,000 Genome Project, dubbed “Genome Korea in Ulsan”, launched in Ulsan Metropolitan City on Nov. 25, 2015. 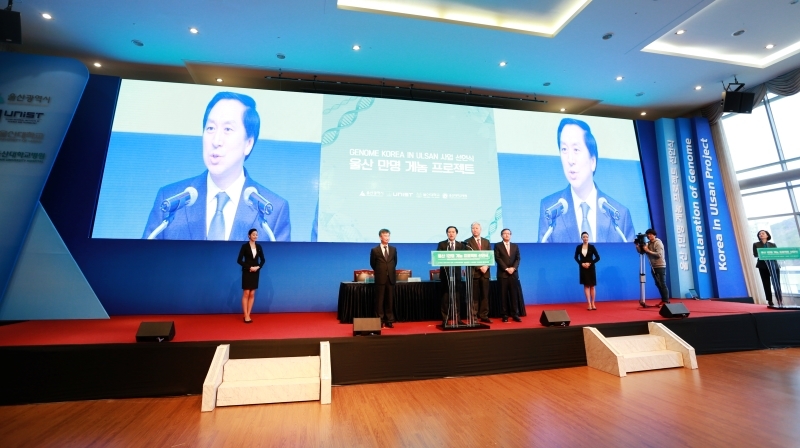 The Ulsan 10,000 Genome Project, dubbed “Genome Korea in Ulsan”, officially launched in Ulsan on November 25th, 2015. The project’s consortium includes Ulsan Metropolitan City, the Ulsan National Institute of Science and Technology (UNIST), Ulsan University Hospital, and the University of Ulsan. 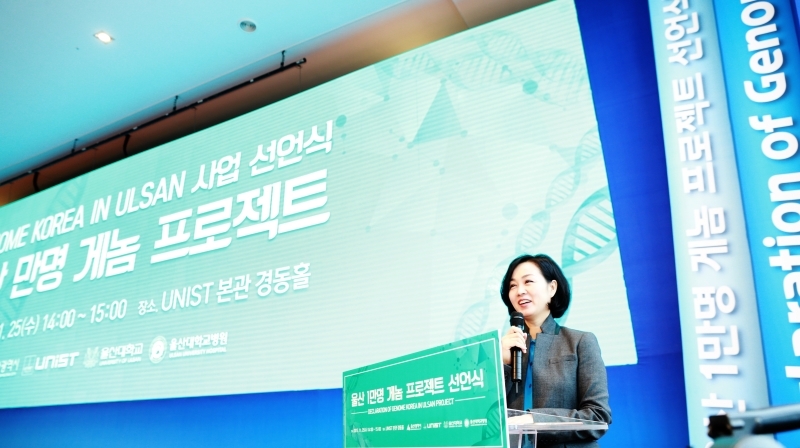 The Ulsan 10,000 Genome Project, dubbed “Genome Korea in Ulsan” project, launched at UNIST. Genome Korea in Ulsan is a large-scale publicly-funded genome project, with an estimated funding of ~US$25 million by 2019. The goal is to map the complete genomic diversity of Koreans, by constructing a standardized gene variation database, detecting rare genetic mutations, and providing well-annotated full genome information for Korea’s growing genomics industry. 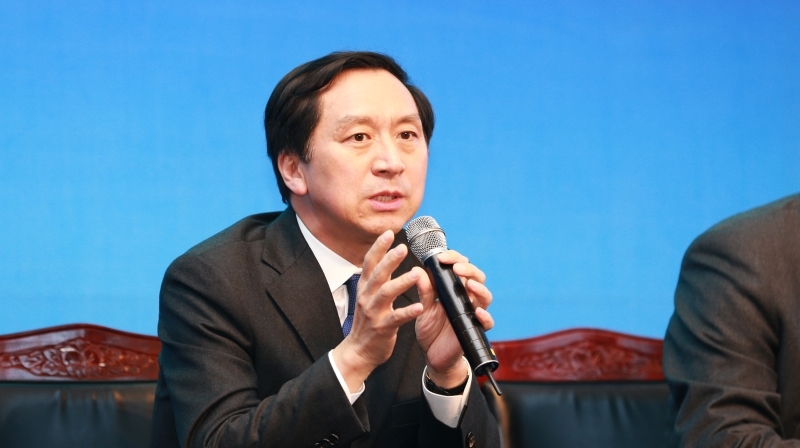 The consortium will seek necessary funding from the public and private sectors to achieve its goal of sequencing all the Koreans in the comingnext decades. The project’s initial 10,000 samples will be collected from both healthy and immunocompromised people. The project’s practical aim is to develop an industrial foundation in genomics for a future biomedical industry. The consortium will facilitate the development of new sequencing and analysis technologies to achieve personalized medicine in Korea. This project will complement the Korean government’s on-going Multi-ministry Genomics Initiative, which began in 2013 with funding of US$500 million over an eight year period to carry out human, agricultural, and medical genomics projects. The signing ceremony of the MoU among participating organizations. Genome Korea in Ulsan is collaborating with Harvard Medical School’s Personal Genome Project (PGP), led by Professor George Church, who developed key genomic sequencing and editing technologies. UNIST and Harvard Medical School will sign a memorandum of understanding for the Ulsan 10,000 Genome Project. Genome Korea in Ulsan is a participatory project in which volunteers will donate blood samples, as well as personal and clinical information. The Korean PGP project, led by Professor, Jong Bhak of UNIST, has already published over 50 high quality individual genomes with the Korean reference genome assembly, funded by the Korean government. 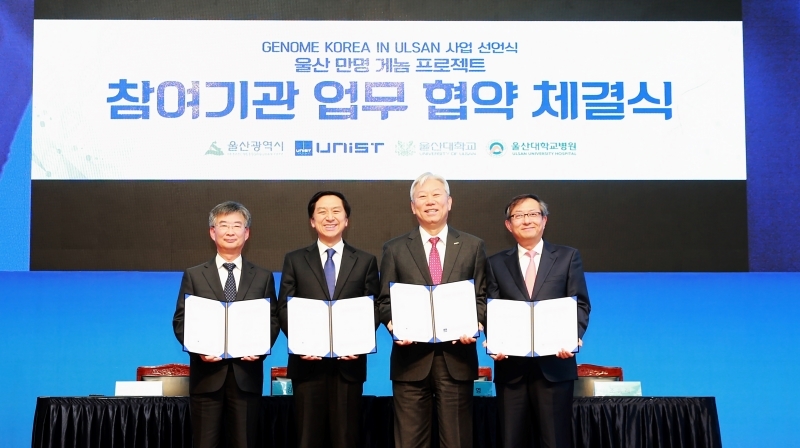 Ulsan’s genomics initiative is the first large scale public project that will expand to the whole Korean population, which is similar to the UK’s 100,000 UK Genomes Project and US President Obama’s initiative to study 1 million genomes. The mayor of Ulsan, Mr. Ki-hyun Kim. The mayor of Ulsan, Mr. Ki-hyun Kim emphasizes the significance of the Genome Korea in Ulsan Project. 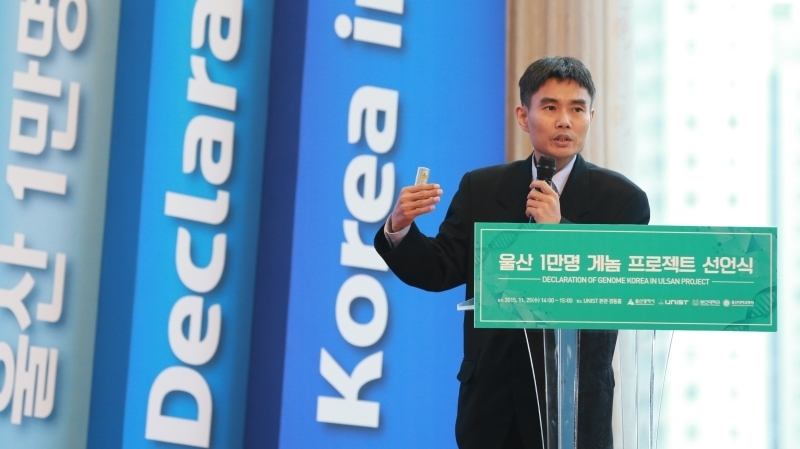 by addressing “We aim to make Ulsan, the hub of a genomics industry in Asia and beyond by linking it to diagnostic and therapeutic medical industrie as a key Korean economic industrialization driving force,” he says. Prof. Jong Bhak (The Genomics Institute) of UNIST. Ulsan is the most industrialized city in Korea, which hosts global business corporations such as Hyundai, SK, and Samsung. Ulsan’s main industries include car manufacturing, ship building, and oil refining, but the city also plans to develop new high-tech industries, focusing on biomedical devices, reagents, new materials, energy storage, and information technologies. 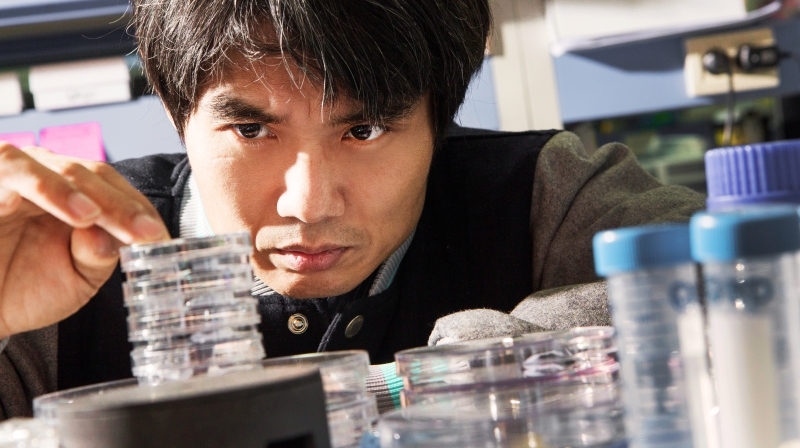 The Ulsan 10K Genome Project is part of an effort to recruit skilled labor and highly value-added business entities.